Welcome to the fantastic world of Virtual Reality ! Yove VR Glasses Turn your smart phone into the ultimate 3D machine for 3D games and split screen movies; works with over 300+ iOS/Android virtual reality apps on Apple App Store and Google Play Store. Search VR or some other related keyword on Google Play or APP store. A truly fun and immersive experience for any age. Protect Your Eyes Blue lights coming from mobile phones do damage to the eyes. With blue coating film, the lenses of this headset can reflect the blue light of your smartphone, safeguarding your eyes. Wide Compatibility Comfortably fits iPhones, Android phones, Windows phones with a screen size within 4.7 - 6.0 inches. MOST COMPATIBLE WITH ANDROID AND IPHONE：Fit for 3.5-6.0 inch mobile device,have a better 3D experience while phone with larger screen!It fits for iPhone 7 6S 6 Plus 5C 5S 5 Samsung Galaxy Note 4, 5 S6 S7 Edge S7 LG G3 SONY Xperia Z3 + HTC One M9 etc (Nexus 6 and LG V10 is NOT compatible!) Please notice your phone size before purchase, the Lmax: 154mm/6.0in,Wmax: 82mm/3.2in. USER-FRIENDLY DESIGN: Comfortable headband, super face foam protector, ideal heat dissipating design Ventilation holes are convenient for inserting earphone and charging ,One second change your phone into IMAX cinema. Also adjustable straps can distract part of pressure from the bridge of nose. FULLY ADJUSTABLE VR LENS：Large adjustable optical resin lenses reduce deformity and remove glare, preventing eye fatigue. Lens Focal Distance and Pupil Distance are fully adjustable to this smartphone VR virtual reality kit. It is perfect for people with low myopia less than 400 degrees. 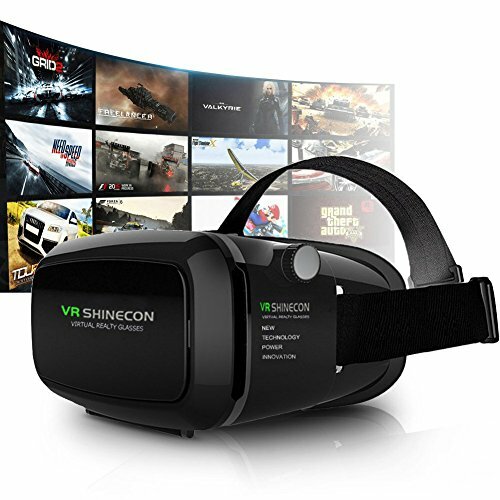 You can get free from your glasses while enjoy the 3D movies or games with the head mounted display 3D VR glasses. QUALITY THIRD GENERATION LENS: reduce clarity to protect your eyes and for longer time use without dizzy, also it have reasonable focal length without any adjustments,but need several minutes to adapt 3D scenes to make it more clear. Suitable for myopic within 400 degree,but not for presbyopia. FRONT COVER: adsorbed by magnet, is easy to be removed. It makes the phone cool while using, and it is great for ventilation for long use. You can charge and use earphone at the same time through the ventilation holes on both sides.Design with Lightest weight and Smallest size, make it portable and good for you to experience the overwhelming visual beauty. If you have any questions about this product by yove, contact us by completing and submitting the form below. If you are looking for a specif part number, please include it with your message.